In this type of System, in automatic operation, thermal sensitive fusible detectors in row are used for detecting fire . 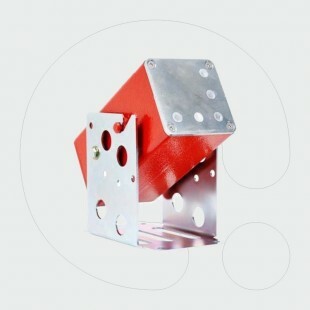 The Suppression Agent is been distributed over the protected areasappliances and inside the exhaust funnel through an ISO Copper Piping and Special Type Discharge Nozzles. 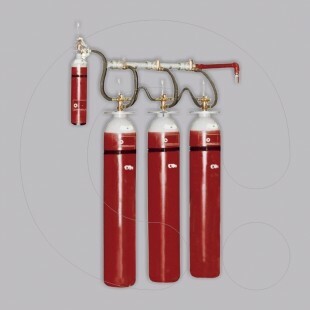 Incase the system consists of more than one Local Application Fire Extinguishers, the operation of each extinguisher is been achieved using a fuse-detonator. 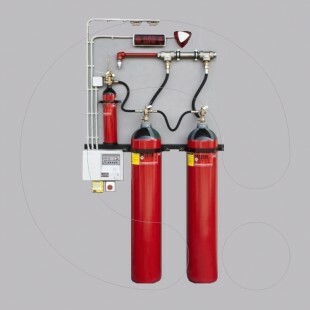 In both automatic and manual activation, the system can be programmed to shut off the electrical power and the gas-propane supply in all or in selected devices for maximum protection against re-ignition. In case of fire, the breaking-melting of any thermal sensitive fusible detector (138°C or 182°C or 260°C), activates the system by electro-mechanical means. 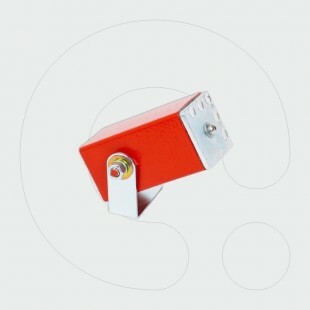 The fusible detectors are connected in a row-form through a stainless steel metal wire. The first end of the metal wire is fixed to the exhaust hood while the other end is connected to an electromechanical position switch. In normal condition, the metal wire is stretched and it pulls the contact of the position switch. 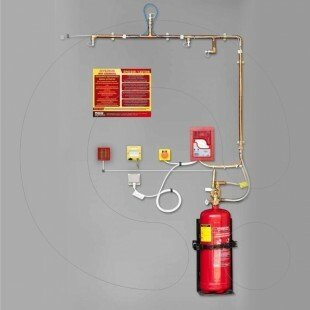 In case of fire, the fusible of a detector breaks-melts and the metal wire that connects the detectors with the position switch gets loosen. 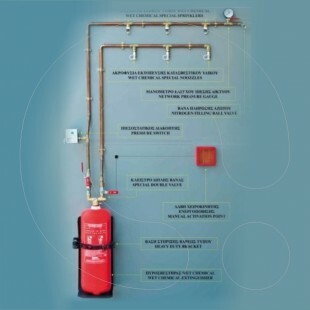 The position switch gets activated and it activates through the Fire Detection Panel of the System the Fire Extinguisher Valve (through the fusedetonator) and then the Suppression Agent is been distributed through the Copper Pipping and the Special Type Discharge Nozzles over the Protected Areas. 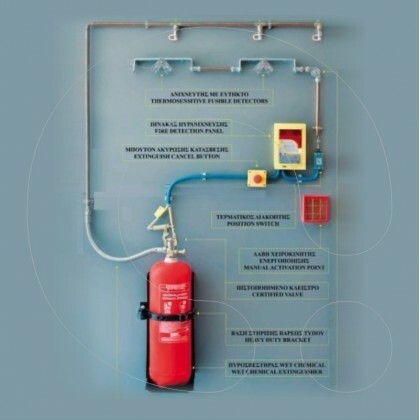 Incase of fire, the manual activation of the system can be done in three (3) different ways (1) Pressing of special manual system activation button that is built-in into the fire detection panel, (2) Pulling of remote control mechanical metal wire handle and (3) Pulling of the fire extinguisher valve rod towards the ground-floor. 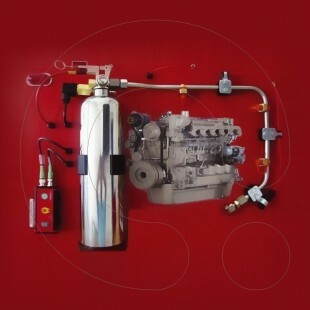 Fire Extinguishers made of Stainless Steel of 10ltr (12 kg vessel) capacity. 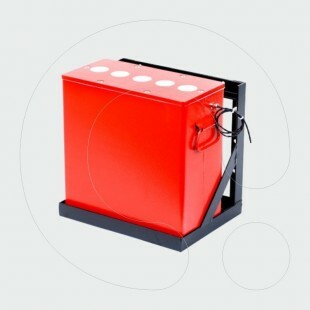 Fire Extinguishers with Anticorrosive Internal Paint of 20 l (25 kg vessel) and 35 l (50 kg vessel) capacity. 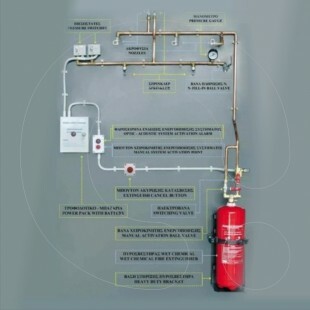 Fire extinguisher certified valve of manual or automatic activation with safety relief valve, certified according CE-TUV. Flexible stainless steel hose (21,7mm x 1/2”) for connecting the fire extinguisher valve with the pipe network. Thermal-sensitive fusible detectors (138 °C or 182 °C or 260 °C. Stainless Steel metal wire and clutches. 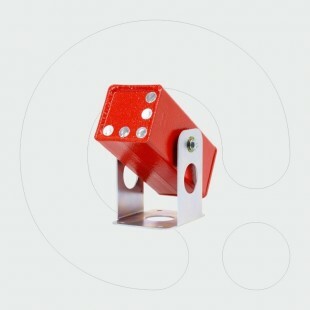 90° metal wire guide roller. 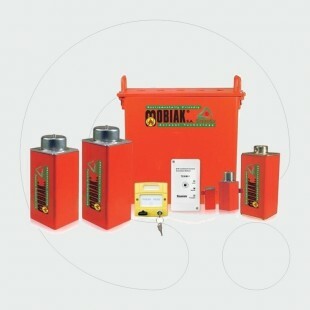 One Zone Fire detection panel with built-in Siren, Battery and Manual System Activation Button.